The stories of explorers, entrepreneurs and scientists begin, sometimes, with curiosity, as was the case of marine biologist Mauricio Gómez, who started the company Salgax. 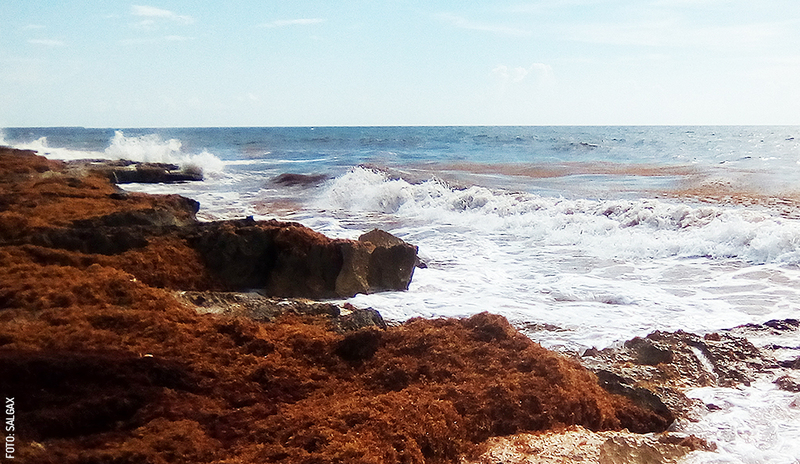 He produces fertilizer made from seaweed, after observing the “Sargassum” arrival to the Yucatecan coasts. What can be done with these algae?, asked Mauricio, who along with Dayre studied and researched the options, until January 2015 when they obtained the first prototype of a fertilizer based on sargassum sp. Since then, this company of Yucatecan origin has been dedicated to offering 100% natural products promoting the care of the environment and taking advantage of biotechnology. Today, they produce seaweed-based fertilizer for fields and gardens with their own brand, Salgax® Biotecnología Marina Aplicada. They continue working to find applications in the cosmetic and pharmaceutical areas. Did you know that the algae can be red, green, or brown? Each one has different properties and some generate toxins, but mostly they provide oxygen and can mitigate global warming. For example, in pre-Hispanic times, spirulina algae was used. In general, they have nutrients that can be used in plants and crops. There is a constant problem on the coasts of the Peninsula due to the continuous overflow of sargassum, the bad smell coming from the decomposition of the algae, causing environmental and touristic impact. Salgax has been able to turn this into an opportunity, thanks to the talent of its young members, graduates of UADY, who have specialized in generating their own methodology to collect the algae, for example in Sisal and Dzilam de Bravo, in an easier way at lower cost with less impact. Then the algae is processed and liquid fertilizer is produced. As a bonus, being totally natural it’s not toxic to pets, so it can be safely used in gardens. A liter of seaweed fertilizer “Jardín” yields enough fertilizer for a 10 meters by 10 meters area. The “Campo” version generates greater plant development and better fruit quality. They have been tested on tomato, citrus, papaya, habanero, cucumber, and aloe, among others.